Difference between revisions of "SwOS"
Warning: Each RouterBoard switch series have their own firmware which cannot be installed on other series models! In case wrong installation is accidentally done, correct firmware has to be reinstalled following instructions from "Reinstall SwOS firmware" section below. RB250GS supports SwOS v1.0 and newer. RB260GS supports SwOS v1.7 and newer. RB260GSP supports SwOS v1.11 and newer. SwOS interface menu consists of several tabs: Link, SFP, Forwarding, Statistics, VLAN, VLANs, Static Hosts, Hosts, SNMP, ACL and System. 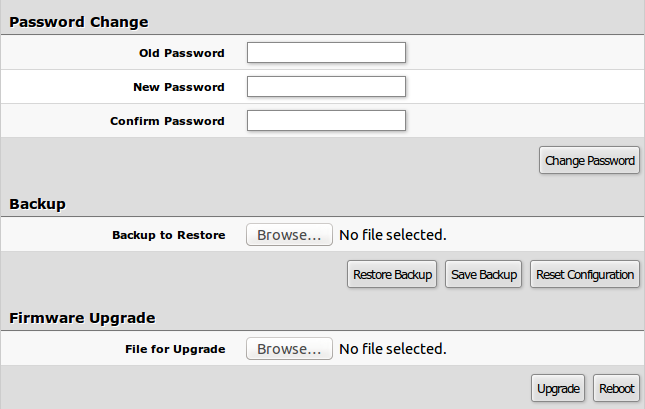 Firmware can be upgraded/downgraded by selecting firmware file and pressing upgrade button. Switch will reboot automatically after successful upgrade. Port1 PoE In Long Cable If enabled, it will turn off short detection on all PoE out ports to allow use of longer ethernet cables. This is potentially dangerous setting and should be used with caution. PoE settings configure Power over Ethernet output on RB260GSP port2-port5 and show PoE status and measurements. Forwarding Tab provides advanced forwarding options among switch ports, port locking, port mirroring, bandwidth limit and broadcast storm control features. On RB260 series switches ingress rate per port as well as rate for broadcast traffic can be configured with Access Control List by setting Rate. ACL must have one port per entry to provide bandwidth limiting properly. VLAN tables specifies certain forwarding rules for packets that have specific 802.1q tag. 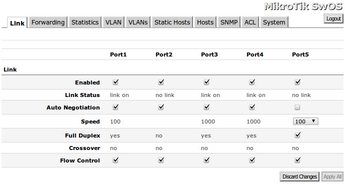 Basically the table contains entries that map specific VLAN tag IDs to a group of one or more ports. Packets with VLAN tags leave switch through one or more ports that are set in corresponding table entry. 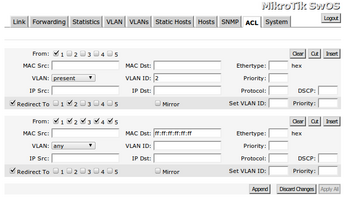 VLAN table works together with destination MAC lookup to determine egress ports. 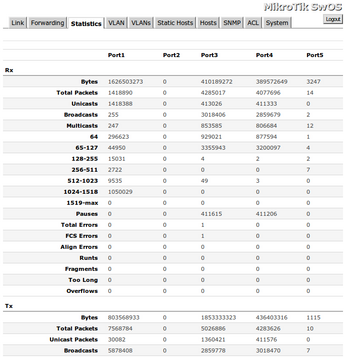 VLAN table supports up to 4096 entries. This table represents dynamically learnt MAC address to port mapping entries. When Switch receives a packet from certain port, it adds the packets source MAC address X and port it received the packet from to host table, so when a packet comes in with destination MAC address X it knows to which port it should forward the packet. If the destination MAC address is not present in host table then it forwards the packet to all ports in the group. Dynamic entries take about 5 minutes to time out. Note: RB250GS and RB260GS support 2048 host table entries. Static host table entries. Static entries will take over dynamic if dynamic entry with same mac-address already exists. Also by adding a static entry you get access to some more functionality. An access control list (ACL) rule table is very powerful tool allowing wire speed packet filtering, forwarding and VLAN tagging based on L2,L3 protocol header field conditions. SwOS allow you to implement limited number of access control list rules (32 simple rules (only L2 conditions are used); 16 rules where both L2 and L3 conditions are used; or 8 advanced rules where all L2,L3 and L4 conditions are used). Each rule contains a conditions part and an action part. 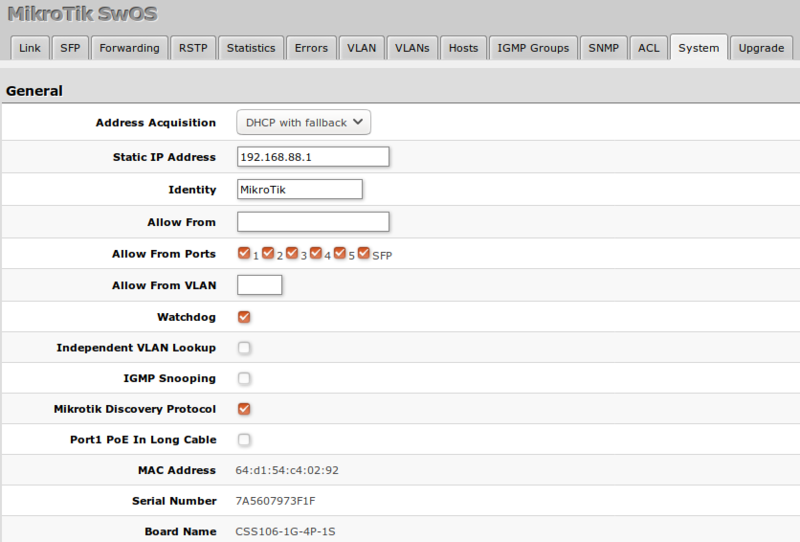 SNMP Tab consists of settings to monitor the Switch remotely. Located on the bottom of case, behind one of the rubber feet of all SwOS devices – resets SwOS software to defaults. Must short circuit the metallic sides of the hole (with a screwdriver, for example) and boot the device. Hold screwdriver in place until SwOS configuration is cleared. It is possible to upload and install SwOS firmware using BOOTP. This example shows how to reinstall SwOS using RouterOS. Warning: Each RouterBoard switch series have their own firmware which cannot be installed on other series models! In case wrong installation is accidentally done, correct firmware has to be reinstalled following these instructions. 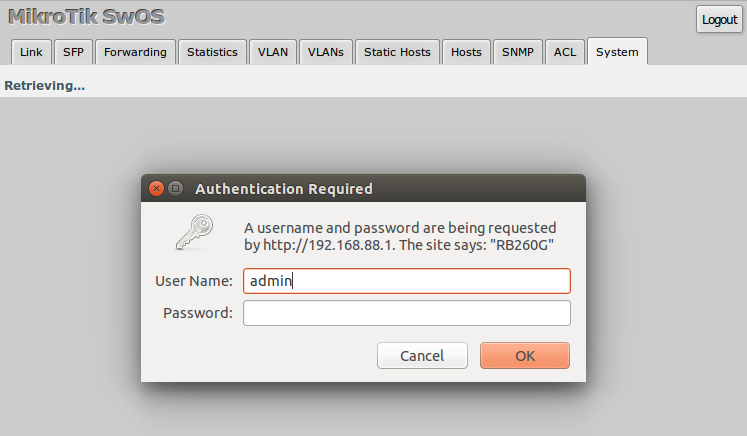 Configure IP address and DHCP server with BOOTP enabled on the installation router. Upload new SwOS firmware file to the router filesystem. Hold the RESET button of the switch when starting it. After few seconds ACT LED will start blinking. Wait till ACT LED blinks twice as fast and release RESET button. Make ethernet connection between the switch and ethernet port you configured DHCP server on. After few seconds new firmware should be successfully uploaded and installed.